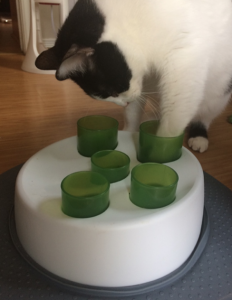 What Does Enrichment Mean For Your Pet? Enrichment is very important for all types of captive animals. Everything ranging from mice to elephants, big or small, feather or scaled all need enrichment. Enrichment can be defined as the action of improving or enhancing the quality or value of something. In terms of animal care, it is when we seek to enhance the quality of a captive animal’s life by providing the necessary stimuli for psychological and physiological well-being. There are a lot of benefits to providing daily enrichment. Animals in the wild have a wide range of experiences and activities in their day to day lives. They spend a large amount of time hunting for food, interacting socially, and caring for themselves. They are mentally fulfilled, but when in captivity we take those experiences and activities away from them they will suffer. Thus implementing enrichment into a captive animal’s life is as important as caring for their physical needs. Enrichment can be provided in a variety of ways. How we implement enrichment will depend on the animal. It can be as easy as making simple changes to the husbandry. An example of this could be placing something new like a branch inside a snake’s enclosure. This branch will be investigated and climbed on, which will provide enrichment. It can also be more involved like hiding food daily for an animal to find which is called foraging. An example of this is having several food dishes, some with food and some without. This could be used for a pet parrot who will have to investigate every dish, hunting for the food. It is important to note that different animals need different levels of enrichment care. Using a feeder puzzle or making it a game to obtain the food are other examples of foraging. There are many different ways to provide foraging to all kinds of pet species which is a fantastic way to enrich their lives for the better. We love our animals and treat them like family. Helping you take the best care of them is important to the team here at Lynwood Animal Hospital. Providing your pet with daily enrichment will keep him/her mentally stimulated and emotionally healthy. This will in turn benefit his/her attitude, energy levels and all around well-being. For more information on enrichment for your pet please contact us for guidance to good resources.